I had my first Wee Bean Coffee Roasters experience recently, after picking up some local produce at the farmers market, (yes – the perfectly “basic” Saturday morning). My cold brew with milk hit the spot, the staff was as friendly as all get-out, and there was this buzz around the owner, Erich Herrmann. True to local Realtor fashion, I needed to know everything about the born-and-raised Southern Marylander behind the caffeine buzz. I learned that Erich was raised with a fusion of cultures, (expressed often through food and drink), due to the fact that his father emigrated from Indonesia to Amsterdam before putting down roots in the United States. Between his upbringing, working in the food service industry from the age of thirteen, and acquiring a B.S. in Environmental Land Use and Planning, he built the foundation of what he’s doing now. Erich’s work in Natural Resource Preservation took him to the Caribbean, and at that stage, his passions “for food, for serving others, and for protecting the environment,” began calling out him. (Food calls me a lot too, probably in a different way.) One of Erich’s goals is to own a coffee farm in his father’s homeland of Indonesia, but we’re glad he’s starting out here. The Maryland Group: Take us through the evolution of a Southern Marylander who is shopping coffee globally and roasting it locally. Erich Herrmann: By sharing my passion with our community, I hoped to bring the tastes of the world to my customers and to educate them on how their local cup has such a far-reaching impact. 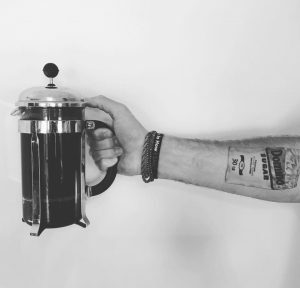 I researched the coffee trade and realized that the coffee bean – something so small and humble – has a significant role in global commerce, community development, and the livelihood of so many people. Coffee is a big part of everyday life, from the hustle and bustle of city living, to the rural farmer up with the sun. While this hard-hitting tiny bean contributes so much to the world, there is much room for improvement- within the coffee trade itself, in the environmental impact of coffee farming, and conservation considerations. 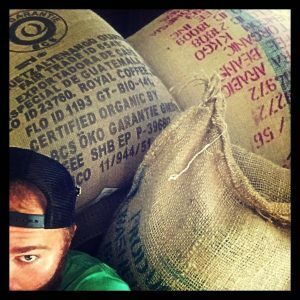 TMG: Give us a rundown of the process, from choosing the grower to your roasting process. EH: The characteristics of our daily cup contribute to a global impact. 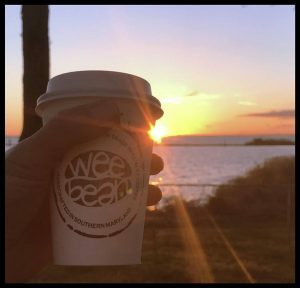 Wee Bean exclusively sources all organic, fair trade coffee beans, and strives to select shade grown, bird friendly, and Rain Forest Alliance certified coffee. Additionally, Wee Bean works to support and empower women in developing countries by purchasing beans from woman-owned and operated coffee bean farms. By implementing a mindful approach and a rigorous process in the selection of the coffees we serve, we ensure that our impact on the environment and on the global economy are positive, collectively beneficial, and sustainable. TMG: What’s on the horizon for Wee Bean? EH: Wee Bean is experiencing a period of substantial growth, due in part to the incredible support we’ve received from the community we serve. We’re currently working on the right brick and mortar location to call home and to provide a comfortable place for our customers, who have really become family. We’ll continue to offer high-quality, ethically-sourced coffee for every hard-working Southern Marylander, from those that work locally to the daily DC commuters. We’re committed to the community we serve and that involves partnering with other Southern Maryland companies, including Mully’s Brewery and Blue Dyer Distillery. We’re also looking forward to a few other organizational alliances. We are beyond excited about the opportunites ahead of us, and are incredibly humbled to have the support of our community. With the three year anniversary of Wee Bean quickly approaching, you might just see a few more surprises from them soon. We’ll be sure to keep you in the loop! You can find Wee Bean Coffee Roasters on Wednesdays and Saturdays at the La Plata Farmers Market, (courthouse parking lot). For some instant gratification, you can shop their website, and check them out on Facebook, and Instagram. This local business highlight is brought to you by the Southern Maryland Division of The Maryland Group of Long & Foster Real Estate. To sell or buy a home in Southern Maryland, or for a local business highlight, email us at Taylor.Burton@LNF.com or visit our website.